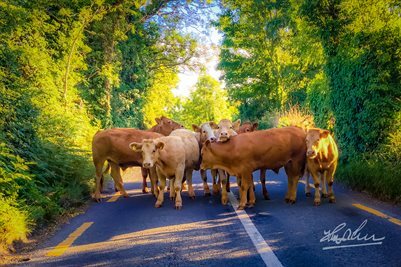 Some friends and I were returning from touring the County Clare countryside one day and ran across a "roadblock" in the townland of Paradise... a small herd of cattle were just standing in the road looking confused! After a few minutes, a farmer came running along with a stick and got them moving. My visiting friends loved it, and we all had a good laugh!